The decision to resign is a gradual process which takes place over time. Employees throw clues which managers either ignore or are too pre-occupied with other things to take notice of. 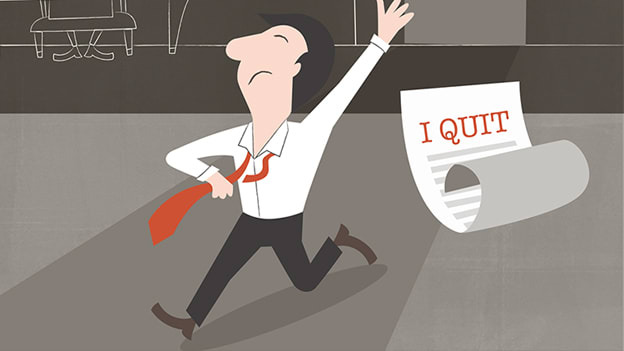 Research reveals that 65% of resignations come as a shock to the manager. You feel your trust has been breached as you didn’t see it coming. My question is, “Do employees, really, quit when they do?” The decision to resign is a gradual process which takes place over time. Employees throw clues which managers either ignore or are too pre-occupied with other things to take notice of. Be as it may, the final resignation is simply, the last nail being hammered into the coffin of disappointments. Managers look upon the entire process of talent scouting with dread. In the current scenario of ‘lack of talent’ available in the market and the opportunity cost and the training cost that the organization has to bear, the financial impact is way high. An employee-manager relationship is no different from a personal relationship. Both operate with similarities. It is a break-up that affects both parties and when you peer, closely you’ll find the tell-tale signs are all too, eloquent. How can you detect the signs that a resignation is coming? When a star employee who has been passionate about work displays tardiness, suddenly has frequent Monday morning blues and Fridayitus, due to sick leave or a personal issue, it’s time to have a two-way conversation. Those who care about making a difference are not clock-watchers. If employees who hung around to participate and be involved in projects are now, working on a clock, means all’s not well. An employee who is super active on Linkedin may suggest that he/she is on a slippery slope. In case, the profile is updated, posts are regular and comment in abundance, it’s a sign that the employee is looking to get noticed. So, sit down and solicit feedback. In case, the employee is going through a personal life-altering event, personal pressures may affect their work and role in the organization. Getting married or divorced, buying a home or a tragedy at home may affect their attitude towards money, time or participation. When a high performer’s error rates increase due lack of attention to detail or is skimming the workload given to them, it’s a red flag. Or when an actively involved employee stops being creative or providing any inputs and is reassigning work to others to be free, it’s a sign of times to come and needs addressing, immediately. An employee constantly bitching, moaning and whining about the organization or the state of its affairs or a client or department needs to be addressed, imperatively. If you do not audit the situation, this behavior can be contagious and infect other co-workers, too. As Managers what can you do? In all of the above, as a manager when you see the first sign, it is a great idea to interact and engage them in a dialogue. Allow the employee the opportunity to feel heard. Do not use your personal bias and judgment. Go prepared and use the conversation to persuade rather than confront. Share the bigger picture and elicit support. In case the employee is a valued contributor, do all you can to address his/her concerns. Learn from their feedback and develop a mechanism for regular engagements, training and professional upgradation and create an environment of growth and development. Enticing the employee who has resigned with a counteroffer is not recommended. They moved on mentally when they began looking for another job. You need to look at the situation in the same way. The time to identify the issue and resolve it has gone past. Many organizations and managers tend to treat employees on their notice period like untouchables. Try to be humane about this. Ensure a handover process that is amicable. Involving them in the new hiring process is even better. Announce their contribution and departure in the right spirit in public. Keeping it hush-hush only breeds gossip. You could issue an immediate email to all co-workers, clients and associates stating that the said employee has moved on to pursue new opportunities effective an x date and you wish them success. Also, share who their responsibilities have been reassigned to. If the employee has been with you for a long period and is valued, give them a deserving send-off. Employees appreciate closure and handling it, maturely provides a powerful message to other co-workers. Employees are always providing clues to their disengagement much before a resignation hits the manager’s inbox. The disengagement is the sign of a larger problem and, your role as a manager is to create an environment that inspires trust through consistent engagement and communication.